My thoughts on how L operates as a panoptic force in the Death Note universe. Jeremy Bentham, a British philosopher, came up with a plan for a prison that would allow every criminal to be observed with as few guards as possible. The Guard-tower would sit in the centre of the prison and the cells would encircle it. Every prisoner could be surveyed constantly via this system. A panopticon is basically a space where everything can be seen. Foucault, a French social theorist and philosopher, ran with Bentham’s prison plan ideas and discussed them in a metaphorical sense when he analysed the mechanisms for surveillance that exist all around us. Schools, factories, hospitals. All kinds of institutions can be used to watch us and instill in us the discipline required to act correctly. I will be loosely using Foucault’s thoughts on panopticism in this discussion. L is a major part of the panoptic mechanisms in place in the Death Note universe. 1) His constant presence. One of L’s first tricks involves narrowing down the area Kira lives in by controlling TV broadcasts. This trick gives us a taste of L’s capacity to see things on a global scale. He works telescopically by drawing Kira’s location into focus. 2) His detachment from the criminal (initially). The inmates held within the panopticon are meant to be, in Foucault’s words, ‘the object of information, never a subject in communication’ . L does start out his investigation by testing Kira’s powers and observing things as if they were all objects in a game. Part of the breakdown of L’s power and his position as a threat to Light is that he becomes familiar with his suspect. He starts to question his own suspicions. When L makes Light ‘a subject in communication’, L’s power diminishes. The problem is that L cannot operate as a cold machine. He should only mine Light for information as if he were an object, but he does more than that. He is influenced by emotional needs. He recognizes that he shares some personality traits with Light, or at least with Light’s ‘top student’ persona, and cannot truly get past that. Near does a better job, I think, at maintaining some distance from his subject. 3) His anonymity. L works hard to maintain a degree of anonymity. He does this via various means, including hiding his face and his full name. When we are first introduced to him in the manga it is during an international policing conference where not even the police know his true identity. To trick Kira he hides behind the alias ‘Lind L. Tailor’. He steals the name from a criminal who he has pretend to be him on TV, thereby testing Kira’s method of killing people. With Lind L. Tailor’s name and face, Light kills him under the premise that he is L. L reveals the deception and challenges Kira to kill him without knowing his name and face, but it simply is not possible. L’s anonymity gives him power. And he knows it; otherwise he wouldn’t safeguard his identity so thoroughly. The police who abandon the task force are well aware of the need for anonymity if their surveillance powers are to be of any use to the investigation. Many leave because they know how easy it is for their identities to be revealed. Anonymity is a requirement for safeguarding panoptic powers. Part of what makes panopticism ethical is that the people that become part of its mechanics are somehow de-indivdualised. The power they wield in the machine doesn’t give them god-like status because they are performing their function in the name of something bigger than themselves rather than in their own name. In other words, they serve their purpose like a cog in a machine not as if they are the machine in its entirety. The machine is not reliant on one particular person, anyone is replaceable. L’s role does have a tinge of this replaceable cog characteristic. L has heirs and his alias is adopted by multiple people throughout the series, including Light himself. L is not an irreplaceable cog in the panoptic machine, despite his impressive intellectual skills. The Death Note universe contains multiple intellectual people who can individually, and in some cases collectively, meet L’s levels of intellect. L is therefore replaceable. 1) Light was aware of the presence of a panoptic gaze early on which meant he was very careful to work around it. He also had inside access and knowledge of the ways in which the panoptic mechanisms attempting to catch him worked. This is evidenced by his cunning plan to evade the prying eyes of the surveillance cameras that are placed in his home. Foucault says ‘he who is subjected to a field of visibility, and who knows it, assumes responsibility for the constraints of power; he makes them play spontaneously upon himself; he inscribes in himself the power relation in which he simultaneously plays both roles; he becomes the principle of his own subjection’. This suggests that the power of surveillance makes us internalise this power and turn it on ourselves. We discipline ourselves because we know we are being watched, even if we aren’t sure where the watching eyes are exactly placed. Light is aware that he is being watched but this does not prevent him from continuing to use the Death Note. The problem is his lack of respect or trust in the society (and the ideals and morals associated with said society) that watches him. He develops a god complex that makes him believe that his application of justice is the only correct form of power. Light refuses to subject himself to the discipline asked of him by the positive laws that provide order in society regardless of their external panoptic gaze. 2) Light’s close relationship with panoptic forces. The fact Light’s father was part of the panoptic mechanisms in place in his society meant he could threaten the rationality of the law. The law could not truly be emotionally detached from its subject because of Light’s blood connection to it. There would always be the ‘but he’s the son of the Police Investigation Bureau Chief’ issue, and that held the investigators back even when they were investigating him directly. Light was also a top student. Educational establishments are part of the panoptic system (L confirms as much when he insinuates himself into Light’s college life). But Light portrays himself as the model student, thereby making himself appear to be the ultimate conformist. Light’s almost too perfect in this respect and this illusion of ultimate conformity is part of what triggers L’s suspicions. Nevertheless, Light’s positive reputation, whilst suspicious in itself, always complicates the premise that he is evil because it is almost too difficult to accept that such a gifted person is so morally flawed by modern cultural standards. 3) The Shinigami. There were forces at work that could not be seen, even by L. The input of the Shinigami and the power they conferred on Light and Misa was something L could not account for. The Shinigami also represent a separate panoptic force. L was ultimately beaten by Light. Light used the shinigami, the one force L had no chance of being able to see. against L. Surveillance was key to L’s investigation but it wasn’t until his dying moments that he finally saw and accepted that Light really was Kira. I say L’s panopticism failed because, although he ultimately discovered the truth in the end, he did not manage to stop Light. But this is not to say that panopticism failed. A key characteristic of the panoptic machine, as I discussed earlier, is that parts are replaceable. Panoptic machinery exists, to an extent, outside of the bounds of individual mortality. The machine still functioned after L’s death and it managed to overcome Light despite his attempts to poison the mechanisms from within. EDIT: Also, having discussed the topic further in the comments (see below), there is the issue of Light’s decline which leads him to contribute to his own undoing. He is a degraded version of himself by the end. The panoptic machine, which has never truly stopped working throughout the whole story, is only then able to catch him because he is a compromised intellectual force, compromised by his own arrogance. Of course, there is another all-seeing eye at play in the Death Note universe: that of the Shinigami. 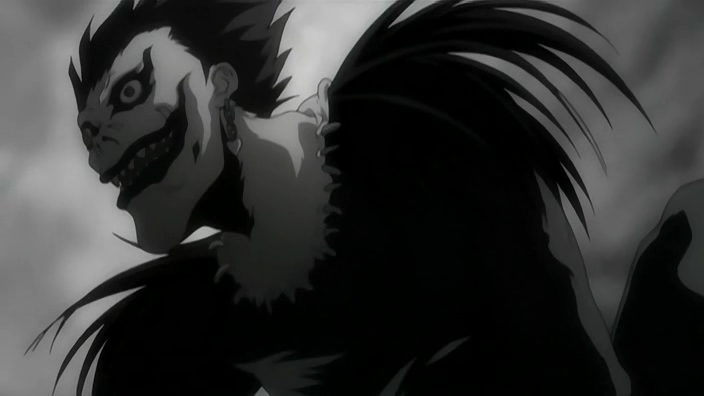 It’s Ryuk that has the final say in ending Light’s life. Ryuk belongs to a legal system that works simultaneously alongside human legal systems. The Shinigami control the balance between life and death. They make contracts (Misa’s acquisition of Shinigami Eyes in exchange for half of her life), they set rules, they make promises that they always fulfil (Ryuk’s promise that he will be the one to take Light’s life in the end). Light is surveyed by two major forces throughout the story and in the end he cannot breakdown or break free of the machinery of either.